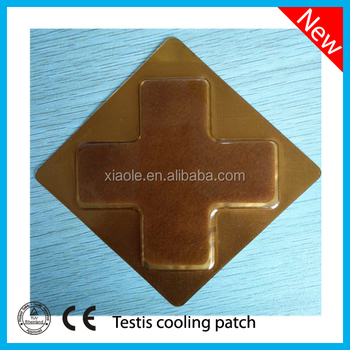 Packing of testis cooling patch: 1pc/bag, 6bags/box(5 boxes one course), or pack number customize as requirement. The product is composed of non-woven backing layer, gel layer, polyethylene film covering layer, and etc. The gel layer is a mixture of Sibin pumex(stone needle) power and gel. The product should not contain ingredients that exert pharmacological, immunological or metabolic effects. The product based on thousand year ancient method, named: “Gold cooling method”, the gel is for physical cooling down, the span power for dredge meridian. Before use, clean and dry the surface skin of the position where the gel will be applied. 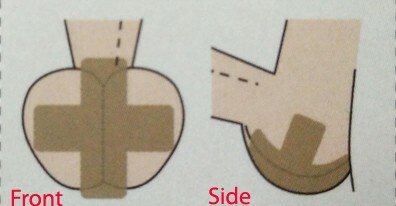 Uncover the transparent film, and directly apply the gel side along middle line of the testis to cover the testis. Suggest paste before sleeping take off before bed, continuously using for one month as a course of treatment or consult a doctor.